Which Animal Sign Were You Born Under? Ready to stitch your way to good fortune? This collection of animal embroidery patterns is inspired by the creatures in the Chinese Zodiac, so you can embroider the animal from the year you were born! The patterns below range from cute and cuddly to vintage and traditional. And you can choose from designs that are easy for beginners or a little more challenging. All you need to do now is​ ​look up your Chinese Zodiac sign and start stitching! According to the Chinese Zodiac, people born in the year of the rat save and collect things, and it looks like this little rat likes gathering flowers! SewJenaissance's pattern is simple enough for beginners, but the floral details make it extra special. Paul Bunyan and his friend Babe the Blue Ox are good examples of the hard-working, persevering quality attributed to those in the year of the ox. These adorable designs are clip art, but you can print the images and use them as embroidery patterns! Tigers are seen as powerful, brave, and independent, and people born on this year are believed to make excellent leaders. It may look like the girl in this pattern by OddAnaStitch is hiding behind a mask, but maybe she's just showing her true self! Those born in the year of the rabbit are known for gentleness and sensitivity, much like this lovely rabbit embroidery pattern. It's styled with a folk-art look and surrounded by designs that you'll love stitching. The lines, dots, and flowers create the perfect opportunity to practice a variety of stitches. Dragons are typically associated with stories of adventure, and the Chinese Zodiac also connects dragons with people who are a little mysterious, exciting, and even romantic. Stitch your own bit of adventure and excitement with this flying dragon pattern. It's free and perfect for stitching as redwork or to create a medieval-themed hoop. 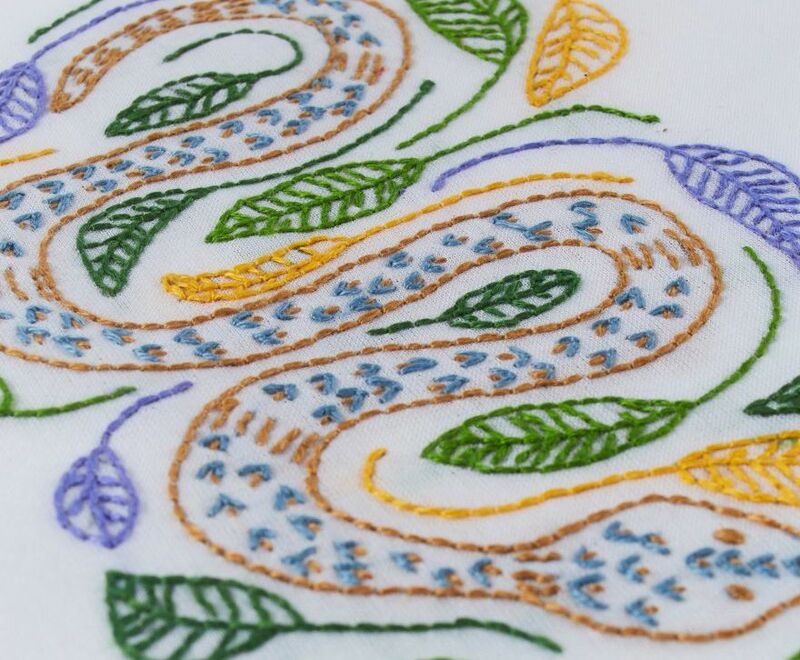 You may find mixed or even contradicting qualities for a person born in the year of the snake, but everything in this snake pattern by Cozy Blue for DMC fits together. The "S Snake" slithers through a bed of leaves, showing the sly wisdom that snakes are known for. The Chinese Zodiac says that folks born in the year of the horse are enthusiastic and energetic, but they also may lose interest in things quickly. With some luck, that enthusiasm wins out when stitching these gorgeous vintage horse patterns, shared by Doe-C-Doe. There's a lot to stitch here, but worth it for results! Sometimes also referred to as the year of the sheep or ram, this Zodiac animal represents a kind, compassionate hearted person. And when it comes to goats, the critter in this sweet pattern from Shiny Happy World certainly looks kind! He's humbly munching on a tin can labeled with french knot peas. If you're born in the year of the monkey, you're probably clever and curious, just like this DIY embroidered monkey doll from Kiriki Press! The kit comes with pre-printed fabric so you follow the pattern, then assemble it into a sweet toy. The stitching is easy and great for beginners! The Chinese Zodiac says that roosters can sense things and react quickly, which is helpful for this rooster weathervane pattern. But it also says that their unlucky directions are east and north, which could be a problem. No matter how you feel about luck, just be sure that you keep stitching in the right direction. Just like the golden retriever featured in this embroidery pattern from Penguin & Fish, people born under the year of the dog are usually loyal and have good relationships with others. This particular golden is just a puppy, making it especially cute. Not to mention, the swirls and designs in the background look so enjoyable to stitch. People born in the year of the pig are likely to be diligent and logical, plus, pigs are often a symbol of good fortune in wealth. When you stitch this free pig pattern you might want to add a line to the top to make it a piggy bank. The finished embroidery just might make you squeal with delight!